Charge & store your Apple Watch in style! We present our one-of-a-kind, wooden Apple Watch Dock. The innovative docking station is made of premium solid wood & brushed steel! It offers your iWatch a save place & a stylish home for uncomplicated charging. 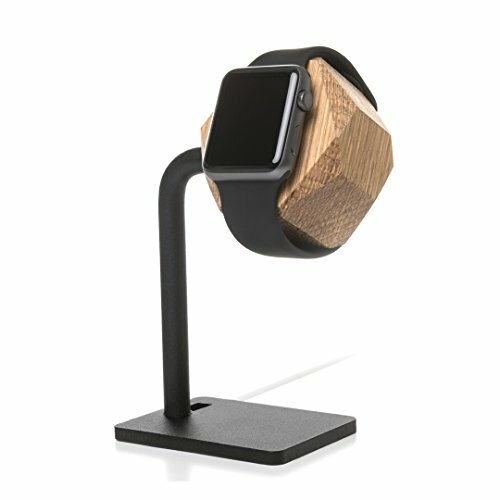 Quality materials meet a unique look: Our charging station combines a premium design, high-quality materials & unique features: The storage for your Apple-Watch is made of solid wood, manufactured in one piece & fits perfectly with every bracelet because of its special hexagonal shape. The Apple-Watch-Dock is available in solid oak and walnut! The mixture of wood and metal forms a unique, minimalistic design that accentuates your Apple Watch as good as on your wrist and is efficient and practical at the same time. Quality comes first. Functionality second! Your Apple charging adapter can be easily clicked into the wooden cube. This exact symbiosis creates a tailor-made surface for optimal charging. The wooden cube is pivotable and can be put into the optimal working angle while being charged. A real innovation! Due to the intelligent cable routing for your original Apple Watch charger cable (the Dock is compatible for both versions of the Apple cable), the cable can be guided to the socket invisibly along the steel-base and guarantees the most minimalistic look possible! Ultimate Compatibility: Self-explanatory our charging station is compatible for all Apple Watch Generations (1, 2 & 3) and for both sizes (38mm/ 42mm). Additionally, it can be used with every Apple-Watch-Wristband. You can use your original Apple watch bracelet, as well as any leather, plastic or wooden band. German-engineering: Each piece has a natural, unique look telling its own story. We hand-pick & re-purpose the wood to bring each customer a one-of-a-kind companion. If you have any questions about this product by Woodcessories, contact us by completing and submitting the form below. If you are looking for a specif part number, please include it with your message.